Well, Mom's visit is over. She was here for two weeks and it was awesome, but now she's gone...and Hubba Hubba leaves me tomorrow for 8 months. Le sigh. Anyway, I couldn't send Mom home without some of my DIY goodness! However, she couldn't exactly get the chairs that she wanted onto the airplane. The day of her arrival she was complaining about never being able to easily find her luggage because EVERYONE'S is black! So it hit me then that I could customize hers in some way to make it easier to differentiate from the rest and cute to boot! Then of course the visiting commenced and that thought was stuffed into the back of my mind until the day before she was leaving! 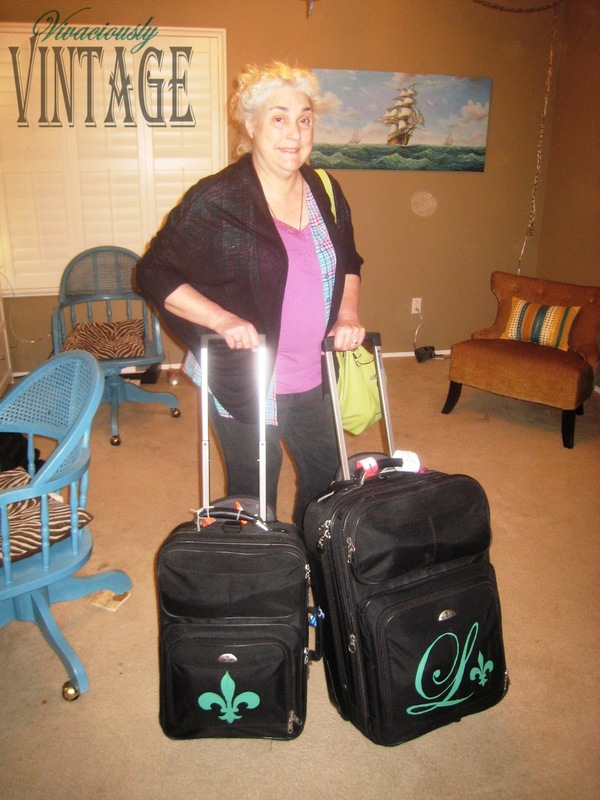 First you'll want to design and print the image that will go on the suitcase. 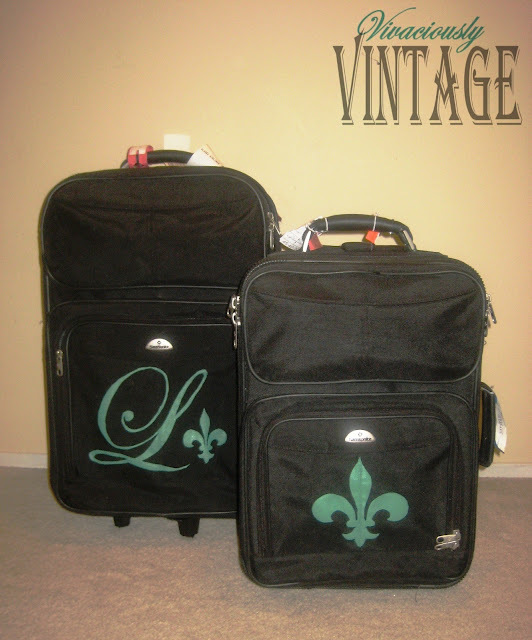 I wanted hers to coordinate but not be exactly the same, so I just created an "L" (the font is Edwardian Script) for Linda with a little fleur de lis next to it for the larger suitcase. 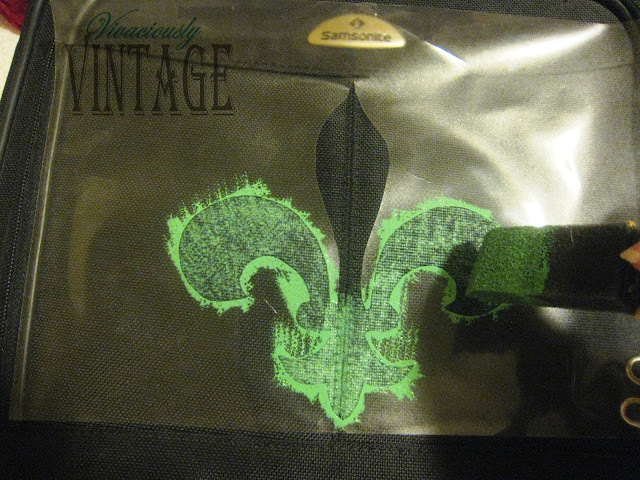 The smaller one just got a single fleur de lis. Print your image of choice to scale. Make your stencil. This is the worst part, in my opinion...one of the many times I find myself wishing I had a Silhouette Cameo. One day, one day! It's pretty easy, but tedious and time consuming. The simpler you make your design, the faster it will be! Lay your printed image underneath the contact paper. You should be able to see the outline of the image. I just used one piece of double sided tape to hold them together. 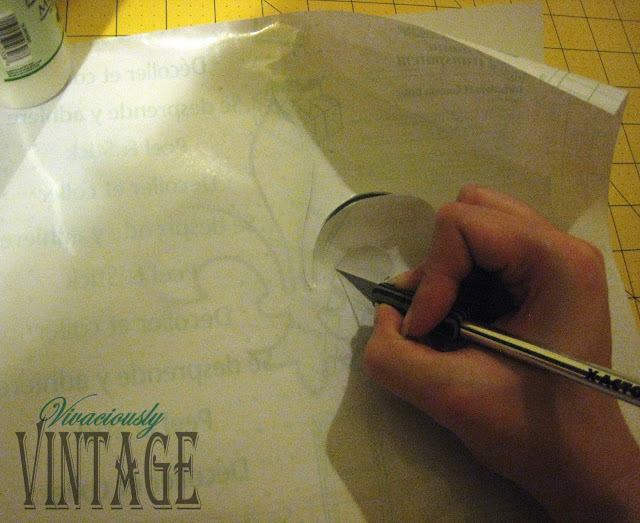 Then cut, cut, cut with your Xacto knife until your stencil is complete. Be sure to save the innards of the design, if necessary. Example, I needed the center portion of each loop in the "L". Tip: The end of a Xacto knife hurts! Mine was all bumpy! I use a pencil gripper on the end of mine so it's not miserable! 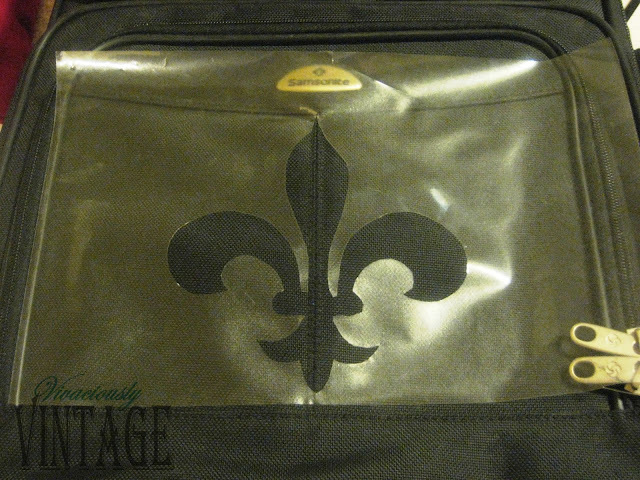 Peel off the backing and align your stencil onto the suitcase. Contact paper comes in a roll, as a result your design is all rolley polley! Be careful removing the backing, but luckily it's pretty forgiving if it sticks together in a few places. I didn't have too much trouble with mine. Do the best you can to get the edges to completely adhere to the luggage. Mix your paint and medium. The textile medium gives the paint a softer finish, so it's not crazy stiff on the fabric. 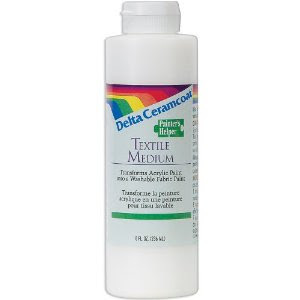 Follow the directions for mixing the paint and textile medium. Mine was 2 parts paint and 1 part textile medium. It said to use acrylic paint, but I used latex and it seems to have worked just fine. Begin painting! I just used a small foam brush because I don't have any fancy stenciling brushes, and it worked well. 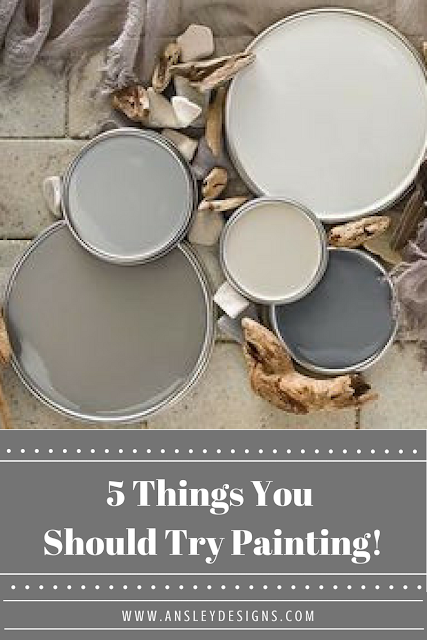 Dip your brush into the paint mixture, wipe off the excess, and dab the paint over the stencil. Be gentle because you don't want any going under the stencil, if possible! Don't brush the paint on! Dab it! The type of fabric on her suitcase really absorbed the paint, it took me about 5 coats to get a solid finish. To hurry things along (it was, after all, midnight and we had to get up at 4am so she wouldn't miss her flight!) I resorted to using my hair dryer to speed the drying time. I used the cold shot option to dry the coats of paint. The paint mixture actually dried really, really fast! Update: Mom said that her luggage made it through the rough flight home unblemished! She also said that it came down the carrier on it's front...so be sure and decorate the backside, too! P.S. My sister is going to be crazy jelly because she loves fleur de lis! PP.SS. You could use this tutorial on almost anything! The back of your upholstered dining chairs, an old wing back chair, pillows, even a sweatshirt. Perfect! Life of the Party at: Elizabeth & Co.
What a great idea! Pretty and it will help make your mom's luggage so much easier to spot at baggage pickup! I purchased some used luggage for my kids to use for our Disneyland trip, and I hate how plain they look. I wanted to make them to look fun and unique, just like each of my kids. 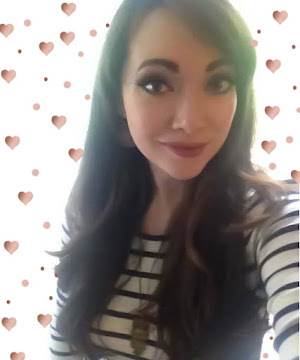 I cam across this tutorial and i LOVE it! You are so creative! Thank you for sharing! Aww thank you! And my mom says it's still holding up really well! 2 years strong!